Are you aware that there is a difference between substance abuse and substance dependence? If you are not, that’s okay. After all, many people erroneously use the two terms interchangeably. But, in order to get a better understanding, stick with me so that together we can take a deeper look to find out the difference between substance abuse and substance dependence. First, let us consider the relationship between the two. How is substance abuse related to substance dependence? In the context of substance use, abuse and dependence are two sides of the same coin: addiction. Abuse is the habit of indulging in the repeated use of a substance and dependence is the condition of the user’s inability to live normally without using the substance. In other words abuse is less serious than dependence. Substance abuse is the result of a desire and habit to regularly use a substance or drug. The common result of abuse is the intoxicated feeling sometimes referred to as a high for the user. The downside is that the substance user will forego other important activities and ultimately become dependent or addicted to the substance. This is important because continued abuse is likely to lead to dependence. Substance dependence is the state of a substance user being unable to lead a normal life without using the specific substance. In other words, substance dependence is the state of true addiction such that the dependent person will do anything to get his addictive substance. Substance dependence usually follows continued abuse such that increasing amounts of the abused substance are needed to keep the user in his intoxicated state. As this happens, behavioral and physiological changes come about so that the user is seriously affected if he goes for an extended time without topping up with the substance. 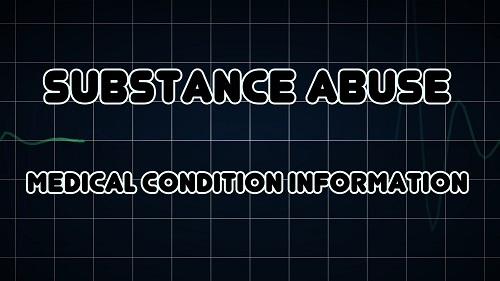 The effects of substance abuse depend on the specific substances. However, the effect is either stimulating leading to a high, or depressive (sedative) leading to a slowing down of the user. Many substances can be used. These can be divided into three broad categories; illicit drugs such as cocaine and heroin, prescription and over the counter medication drugs such as valium and codeine, and readily accessible substances such as alcohol and paint thinners. Of these, the specific most commonly abused substances are alcohol, cannabis, cocaine, amphetamines, heroine, methadone, valium, inhalants such as petroleum based glues and paint thinners, codeine, LSD and MDMA, also known as ecstasy. How common is the problem of substance abuse? Recent studies have shown that people in the 18 to 29 years age group are the most likely to be abusing substances. The same study indicated that males are more likely to indulge in substance or drug abuse: 17 to 24 percent of males aged 18 to 29 years, and 4 to 10 percent of females in the same age group. Those above 65 years are the least likely to abuse drugs at 1 to 3 percent for males and less than 1 percent for females. The specific cause of substance dependence remains a mystery. However, various studies have indicated that social habits, psychological problems and genetics are the major determinants of who becomes substance dependent. This can explain why some individuals engage in substance abuse over long periods of time without becoming dependent while others develop dependence within a short period of abuse. These studies point to the need for counseling and medical care of those trapped by substance abuse and dependence with a view to addressing the root cause of their problems. In summary, the difference between substance abuse and substance dependence is that abuse leads to dependence. This indicates that prevention from dependence for those already indulging is at the substance abuse stage. For those already suffering from substance dependence, the best cause of action is to seek professional help. de. "Difference Between Substance Abuse And Substance Dependence." DifferenceBetween.net. February 23, 2016 < http://www.differencebetween.net/science/health/difference-between-substance-abuse-and-substance-dependence/ >.